The first 12-month mission to the International Space Station may launch in 2015, according to Russian media reports. Under the plan, two astronauts — one Russian and one American — would blast off in March 2015 on an experimental endurance mission that's twice as long as current space station stays, officials with Russia's Federal Space Agency (known as Roscosmos) said Tuesday (Oct. 3). "The principal decision has been made, and we just have to coordinate the formalities," said Alexei Krasnov, head of manned space missions at Roscosmos, according to Russian news agency Ria Novosti. "If the mission proves to be effective, we will discuss sending year-long missions to ISS on a permanent basis." Krasnov did not name the two astronauts who will launch on the marathon mission in the Ria Novosti report. Russia's Interfax news agency reported in August, however, that the NASA crewmember will likely be Peggy Whitson, who stepped down recently as the agency's chief astronaut in order to rejoin its active spaceflying ranks. A year-long stay aboard the orbiting lab could help lay the groundwork for manned missions beyond low-Earth orbit, by allowing scientists to study how long-term spaceflight affects the human body. That objective may be of great interest to NASA, which is currently working to send astronauts to destinations in deep space. In 2010, President Barack Obama directed the agency to get people to a near-Earth asteroid by 2025, then on to the vicinity of Mars by the mid-2030s. According to some mission concepts, a manned roundtrip journey to Mars would take about two years to complete. While nobody has yet resided aboard the International Space Station for a complete year, such a long orbital stay is not unprecedented. Cosmonaut Valery Polyakov, a medical doctor, lived aboard Russia's Mir space station for 438 consecutive days during a mission that began in January 1994 and ended in March 1995. Polyakov's flight helped Russian scientists assess the physiological impacts of long-term spaceflight. But more recently, the nation took an in-depth look at the psychological stresses a marathon mission might impose. In June 2010, six volunteers representing Russia, Europe and China embarked on the Russian-run Mars500 mission, a simulation that aimed to recreate the isolation and mental stress of a trip to the Red Planet. They emerged from the Moscow experimental complex in November 2011 after 520 days. 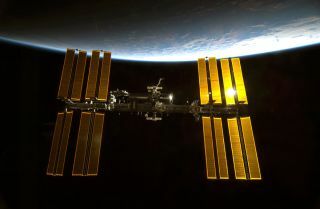 The $100 billion International Space Station is a partnership involving NASA, Roscosmos and the space agencies of Europe, Japan and Canada. Construction began in 1998, and the orbiting lab has been continuously occupied since November 2000. Three astronauts currently reside aboard the station. They will be joined by three more spaceflyers in a few weeks, rounding out the current Expedition 33 to its full complement of six crewmembers.